The Fischbowl: What Will You Share Today? Dean says it so well in his K12Online Preconference Keynote. This is worth 25 minutes of your time. Really. If learning shouldn't be confined to the four walls of your classroom, should teaching? Why would we hoard good teaching and learning? What did I share today? 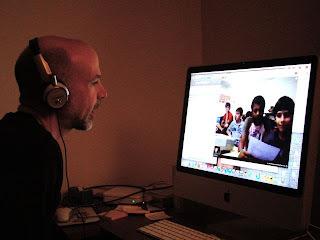 Well, at 6 am my time I Skyped for about 25 minutes with Sharon Peter's students in Mozambique - they had some questions for me. Then I Skyped for about 5 minutes with some teachers in Florida about Skype - they just got it opened up through their filter. Very powerful video. Thanks for sharing, Karl. Wow. And there are still teachers who hoard lessons from fellow department members. Taking "Sharing" from something "extra" to an "obligation" is a leap we all must take. Makes me think I don't share enough, and I want to do more. Inspiring. Also, this is a great avenue to work on technophobic teachers; the sharing comes first, for the sake of the students, and us. Oh yes, by the way, here's how you can share.